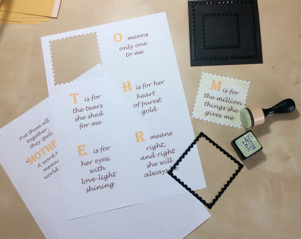 Our popular regular guest Dawn MacFie has put together a step-by-step of her very popular star mini scrapbook for Mother's Day! You can make it as personal as you like too, with sayings, drawings from the children and photographs. 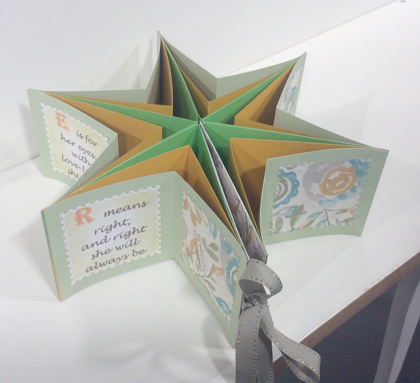 You can make this mini book as a 6 or 7 pointed Star - the choice is yours! Cut 6 at 12 inches x 4 inches. Cut 6 at 10 inches by 4 inches. Cut 6 at 8 inches x 4 inches. 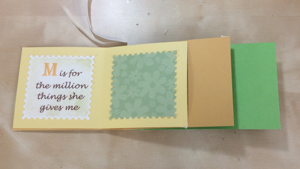 Now fold each piece of card in half and attach double sided tape to each one, as you can see in the picture. Now go to my website > http://dawnsinspirations.com/star-mini-book-tutorial/ to download and print off the sentiments sheet to add to your project. I have die cut these out using the nesting dies from the Hochanda website. Then I have inked over the card while the die is still in place to give a white outline to each sentiment. 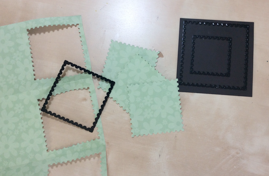 Using the same dies, I have die cut some matching photo mats in patterned paper. You could also die cut plain paper and get your children to draw pictures on these. 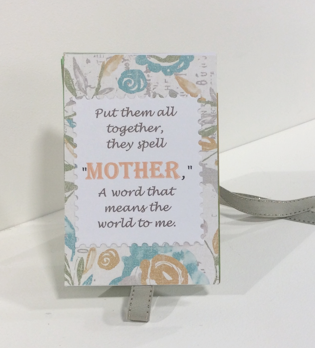 This makes a really personal and special gift for any grandmother on Mother’s Day. Now stick both your sentiments and photo mats/pictures to the smallest of the cards (8 inches x 4 inches). 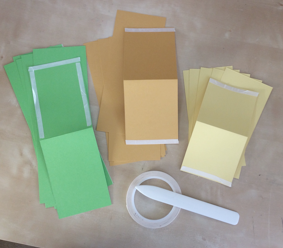 Now layer up the three sizes of card and remove the double sided tape to make each page. 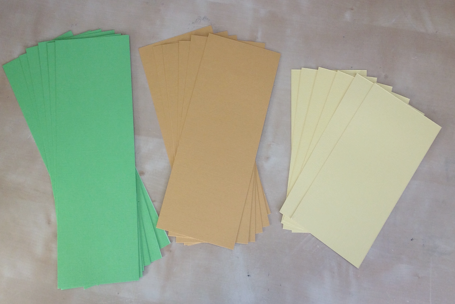 Cut 2 pieces of card 6 inches x 4 inches for the covers of your book. Cut out from the spare card 3 smaller size shapes from the nesting dies. 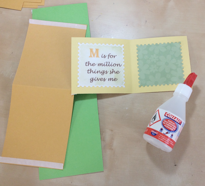 Then using letter dies cut out the word for the front of your book. Also cut out the final verse for the back cover of your book. 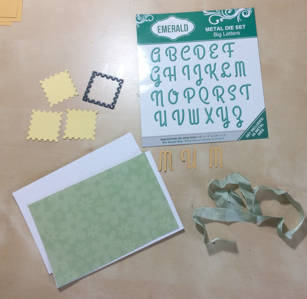 Now join each page together and remember to make sure you have the letters in the right order. 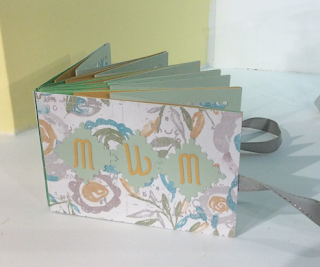 Finally add some ribbon to the front and back of the book before attaching the front and back covers. 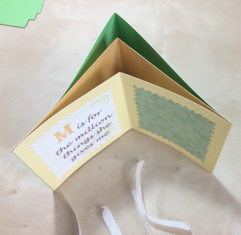 Your Star Mini Book is now ready to be filled with photos and given to that special person on Mothering Sunday! It could be for a Mum, Grandmother, Godmother or Stepmother, just change the title on the front of the book to make it personal to you. 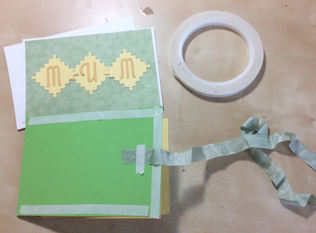 This will be a Mother’s Day gift that will be treasured for years to come and I do hope you enjoy making it. For more demos and step-by-step projects, tune into Hochanda live online, on Freeview channel 39, Sky channel 663 or Freesat 817. WIN a Sugar Snap Rosie bunny by Dawn Shoots!